Sunday October 29th 1922 Took a ride with Ott & Fannie. Had dinner at Hedges. Evening at home with Hattie. The others at Sheldricks. wrote Birdie. Monday October 30th 1922 Did some ironing in AM. Rested in PM. Later took ride with Ott & Fannie. Home in evening with Hattie. Wrote Lizzie & Laura. 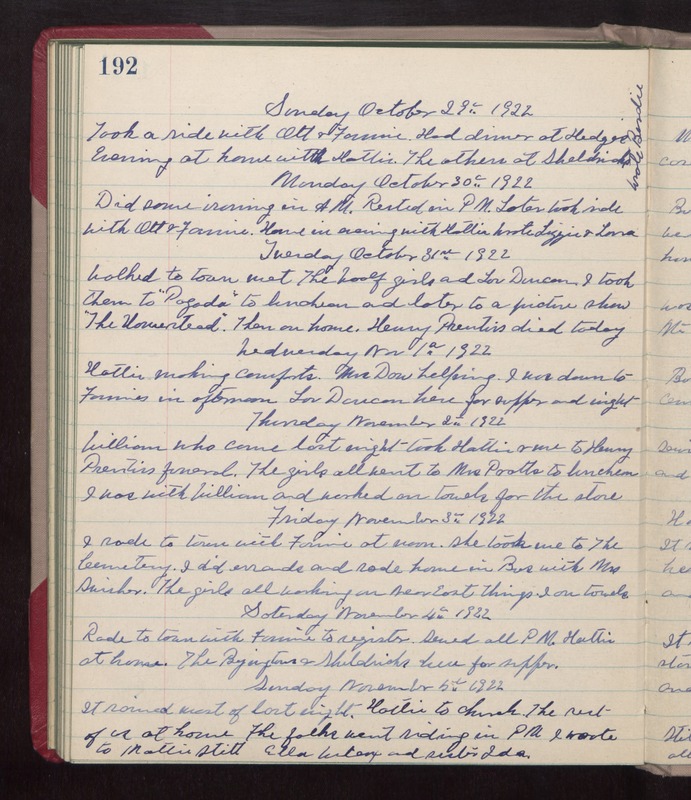 Tuesday October 31st 1922 Walked to town. Met The Woolf girls and Lou Duncan. I took them to "Pagoda" to luncheon and later to a picture show "The Homestead." Then on home. Henry Prentiss died today. Wednesday November 1st 1922 Hattie making comforts. Mrs Dow helping. I was down to Fannies in afternoon. Lou Duncan here for supper and night. Thursday November 2nd 1922 William who came last night took Hattie & me to Henry Prentiss funeral. The girls all went to Mrs Pratts to luncheon. I was with William and worked on towels for the store. Friday November 3rd 1922 I rode to town with Fannie at noon. She took me to The Cemetery. I did errands and rode home in Bus with Mrs Swisher. The girls all worked on Near East things. I on towels. Saturday November 4th 1922 Rode to town with Fannie to register. Sewed all PM. Hattie at home. The Byingtons & Sheldricks here for supper. Sunday November 5th 1922 It rained most of last night. Hattie to church. The rest of us at home. The folks went riding in PM. I wrote to Mattie Stitt, Ella Wilcox, and sister Ida.